By Mark Stellmach, Fuel Management Services Inc.
Diesel fuel has many advantages as a generator fuel, and it is at its best when operators take preventive measures and preserve fuel integrity. Effective fuel maintenance is a simple process that involves sound handling and storage procedures, additive usage, and periodic testing. And in the hands of an ambitious supplier or contractor, fuel maintenance concerns present a valuable business opportunity. 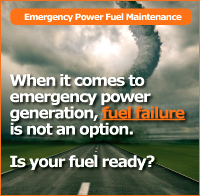 Clients demand reliable backup power, and fuel integrity is a vital piece of that puzzle. The EGSA Fall Conference last September in Denver featured an excellent panel discussion on diesel fuel maintenance, where four speakers outlined some of the important procedures for maintaining diesel fuel quality in storage. It is an important topic for everyone whose success is riding on successful delivery of diesel-fired backup power.To grasp the issues involved in fuel quality maintenance, it helps to understand how the diesel fuel supply has evolved. This article will take a close look at today’s essential fuels – ultra-low sulfur diesel (ULSD) and biodiesel – and explain their properties and characteristics. It will also examine how long-term storage affects these fuels and how preventive maintenance can preserve integrity. The current liquid fuels used today to fuel a backup generator include ULSD and in many cases include a blend of biodiesel whereby ULSD and any biodiesel blends contain a maximum of 15 parts per million sulfur. These two fuels are relatively new to the on-site power generation industry, and it is important to understand the differences between these fuels and the higher sulfur fuels of just a few years ago. Both ULSD and biodiesel have different properties and characteristics than higher sulfur fuels. We could spend an hour and many pages of text discussing just the chemistry aspect of fuels before even getting to the impacts, housekeeping and preventive maintenance solutions. I will briefly review the fuel issues that have made preventive maintenance and tank housekeeping an imperative part of a generator service company’s preventive maintenance contract. There is a whole lot of organic chemistry going on at the refinery level that significantly affects the operability and performance of the end ULSD product. To optimize the production of diesel fuel from crude oil, refiners use increased amounts of heat and pressure. This process of catalytic cracking crude oil results in a fuel that is chemically active, unstable and dynamic. In addition, the process of removing sulfur by hydro-desulfurization exposes the fuel to even more intense heat and pressure, which stresses the fuel even further. These refining processes are the primary reason why ULSD requires extra attention and monitoring.ULSD fuel differs negatively from earlier diesel fuels in the following properties. It has a greater affinity for moisture. It has lower BTU value (negligible: 1 to 2 percent). Resistance to microbial growth is reduced. The fuel is more corrosive. ULSD fuel differs positively in the following properties. The positive changes are welcome and were an intended consequence of sulfur removal. A few of the negative changes (2, 3 and 4) were expected to some degree and changes 3 and 4 are compensated for at the terminal by adding additives. Before ULSD leaves the refinery it must meet the ULSD ASTM D975 test specifications. Remember this point of reference to ASTM D975, as we will refer back to this shortly. Once diesel leaves the refinery the complex distribution chain provides many opportunities for the fuel to come into contact with different sources of potential contamination. Whether distributed through pipelines, ships, barges, tanker trucks and stored at potentially more than one terminal, the fuel comes into contact with contamination sources, which are ever-present. Typical contaminants include water, dirt, rust and microbes (bacteria and fungus). Even if the fuel makes it from the terminal via truck to ultimately the generator storage tank without coming into contact with these usual contaminant suspects, the fuel will have to battle the same issues once placed in storage. Add to this the fact that most diesel – and biodiesel – has fuel stability problems, and it is clear to see that the deck is stacked against good reliable fuel storage and performance. Corrosion in fuel metering and dispensing components as a result of ULSD’s affinity for moisture has been an ongoing problem since ULSD was introduced. This is the preeminent issue being experienced in other ULSD markets that were mandated to use ULSD years before the stationary engine market mandate took effect. Please don’t be discouraged by all this “bad news,” as we’ll soon consider some simple steps and procedures that can minimize these problems. Before we get to those solutions, however, it’s time to briefly get back to the ASTM D975 that I referenced earlier. Once in-spec fuel leaves the refinery, all bets are off as to what it will encounter along the way to its ultimate storage destination, and many of the parameters that define D975 quickly become irrelevant. Just because a fuel “meets spec” on delivery does not ensure that it will perform reliably after being placed in storage for some time. The backup power industry is uniquely challenged in this regard because turnover can be low in a fuel storage tank for a back-up generator. The average shelf life of today’s diesel fuel is approximately six months before the natural dynamic nature of the fuel starts generating particulate and sediment. This particulate and sediment is normally made up of the fuel itself as hydrocarbons – the building blocks of any liquid fuel – begin sticking together to form longer chain molecules. This process is inevitable given the fuel’s instability, and as the process continues what once began microscopically will then produce macroscopic sediment. Not only is ULSD subject to fuel stability concerns, but according to the National Biodiesel Board (NBB), biodiesel being stored for longer than six months should be treated with a fuel stabilizer. Because today’s liquid fuels are chemically active, ULSD and biodiesel are dynamic liquids and require monitoring to ensure fuel reliability. Fuel begins its life “in spec” with the ASTM requirements, but time, storage conditions and transportation are unkind to ULSD and biodiesel. Change happens, and it is all bad; nothing good comes about from the natural changes fuels undergo these days. The specifications tested before a fuel leaving the refinery are an important designation that the refinery has done its job to make a fuel that conforms to ASTM D975. After that it’s the responsibility of the fuel handlers, fuel purchasers and end users to take care of that fuel to ensure its ultimate reliable operability. This is where fuel maintenance practices come into play. The days of storing and ignoring diesel fuel are gone. Today, industry leaders universally recommend preventive maintenance practices for fuel in storage. The myriad threats to fuel integrity can be managed through routine fuel condition monitoring; testing of relevant fuel parameters; and treating stored fuel with appropriate additives. Annual or semi-annual fuel testing and additive treatment has been proven to take the risk out of storing fuel by providing a high level of reliability assurance. And therein lies opportunity for generator service companies, because annual fuel testing and maintenance creates another source of service revenue that is easily integrated into their existing service contract. Treatment with a fuel additive further provides a level of assurance that the fuel will be ready when called upon. Proper additive application improves fuel storage stability, prevents corrosion, kills and prevents microbe growth, disperses sediment, and manages moisture accumulation. Please watch for my future articles in Powerline, which will address specific fuel quality issues, testing parameters, treatment approaches, and the marketing of value-added services. 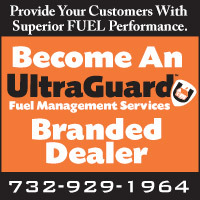 Mark Stellmach is President of Fuel Management Services Inc., a provider of fuel quality products and services.